We are having a "Bake Sale" that will run from 4/20-4/27! If you have ever wanted to have your tan or FDE furniture treated with our exclusive "Fakelite" dying process. This would a great time, and you can enjoy 20% of the cost of the service! We will also have a limited supply of Pmags and AK MOE grips that are pre-dyed and ready to go! NOTE! We can not dye your Black or Green sets. Base colors must be Tan/FDE/Coyote/Sand. If you have any questions regarding this service. Please leave them below. Last edited by Echo Nine Three; 04-20-2016 at 01:19 PM. Will the new green color be available as part of the sale? What if I want plum? We are still finalizing our formula for that. However, It will be available soon. As this is geared toward "Fakelite". This promotion will only apply to that color. Last edited by Echo Nine Three; 04-19-2016 at 12:13 AM. Can you die commie 4.5mm folding polymer stock and handguards? As long at its Tan or FDE to start with. Yes we do. Check out here and ship the set to us! Turnaround is about 7 days. Are you going to be doing this again this year? I'm pulling together the furniture for an M92 SBR and I'd like it to be "fakelite" dyed. Also, what consists of a "set" of furniture? I see the pics on the website also have a magazine or grip panels etc included. Mine would probably be a Magpul grip, stock and magazine, manticore Renegade forend and a BCM VG. We may dependent on demand. Truthfully last years was a bit lack luster. Doing sales like this is much like a group buy. You need good participation to make it worthwhile for all involved. Well know that if you do you can at least count me in! I'm just waiting for a BCM vertical grip and then I'll send my parts for plum. 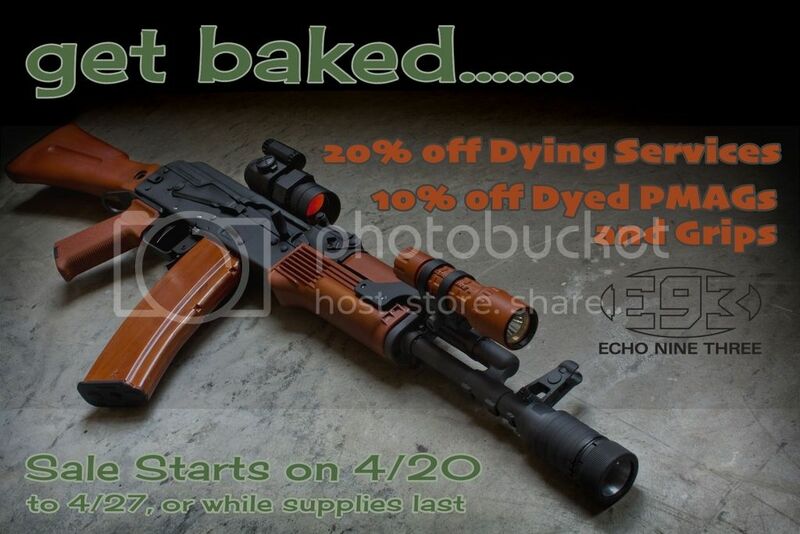 4/20 is my birfday, will you bake me something?